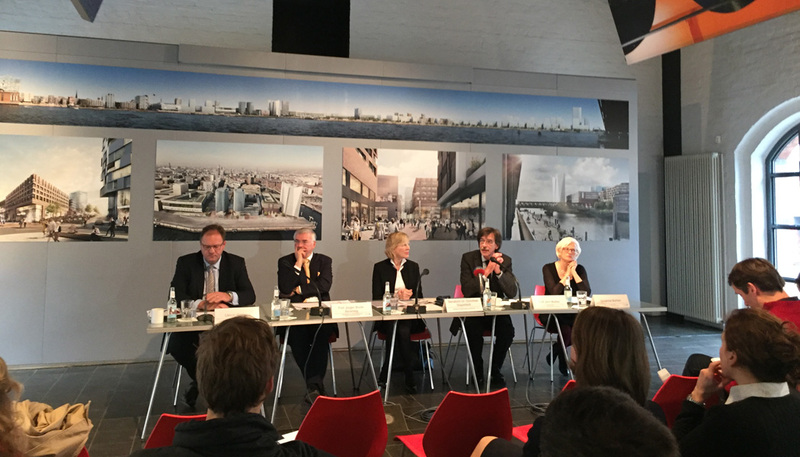 The Elbphilharmonie presented Monday the programme for the upcoming 2017/18 season during a press conference attended by Dr. Carsten Brosda, Senator of Culture and Christoph Lieben-Seutter, General and Artistic Director of the Elbphilharmonie. 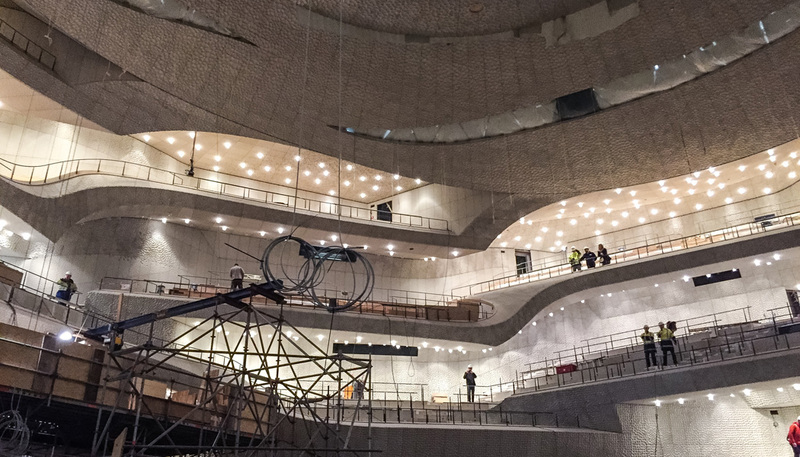 The new concert hall is now setting its sights on its first regular season. By summer 2017, more than 480,000 people will already have experienced a concert live at the Elbphilharmonie since the opening in January. “The 2017/18 concert season in the Elbphilharmonie and Laeiszhalle will be much more extensive than originally planned. Huge visitor interest from Hamburg and around the world enables us to present a tightly packed, varied and exciting programme that can very much hold its own with the magnificent opening months,” said Lieben-Seutter. The programme weaves a web of some 600 concerts that showcase classical music, jazz, electronic music, world music, avant-garde and pop. 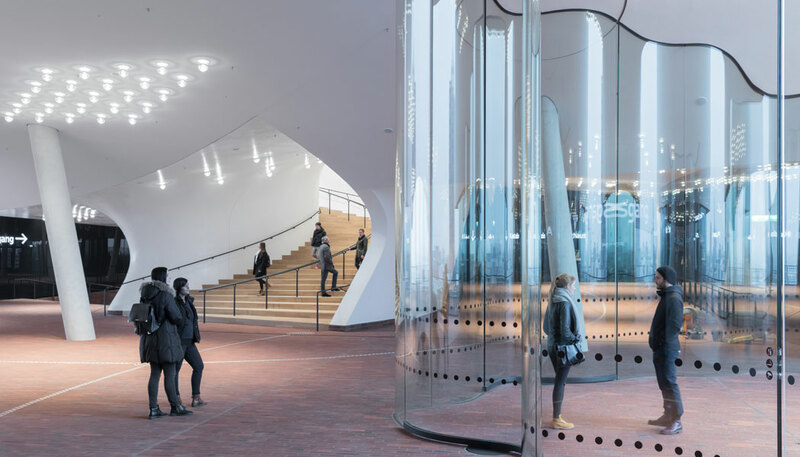 An extended offer for children and youths and the Elbphilharmonie’s world of musical instruments will allow as many people as possible to experience the new concert hall, said Brosda. Over the past few months, there has been a veritable run on Elbphilharmonie tickets. Some 850,000 tickets will be issued for the new season. Ticket presales start at 10 am on June 12, 2017. To give as many people as possible a chance to obtain tickets, a limit of four tickets per concert and no more than ten per transaction applies. More concerts will be added causing a rise in the number of tickets available. Some 20 top-notch orchestras from all over the world will be performing in the Elbphilharmonie including two from the U.S. (Cleveland and Philadelphia), three from London, and leading ensembles from St. Petersburg, Perm, Montreal, Amsterdam, Rome, Birmingham, Zurich, Berlin, Leipzig and Munich. The Symphonieorchester des Bayerischen Rundfunks (Bavarian Radio Symphony Orchestra) from Munich will give performances on three evenings alone. Several themed festivals exploring topics such as music from the Caucasus, Schubert’s “Winterreise” (“A Winter Journey”) and Bohemian and Czech chamber music will be accompanied by enthralling portraits of musicians such as the composer and conductor Peter Eötvös, the pianists Daniil Trifonov and Murrary Perahia, the baritone Matthias Goerne and the artists Bryce Dessner and Yaron Herman, who oscillate between independent, jazz and notated music. The crowning glory of the season will be the 3rd Hamburg International Music Festival (April 27-May 29), which will be held under the motto of “utopia”. Around 12,000 people flock to HafenCity every day to see Hamburg’s spectacular Elbphilharmonie, the view of the harbour and the Speicherstadt. 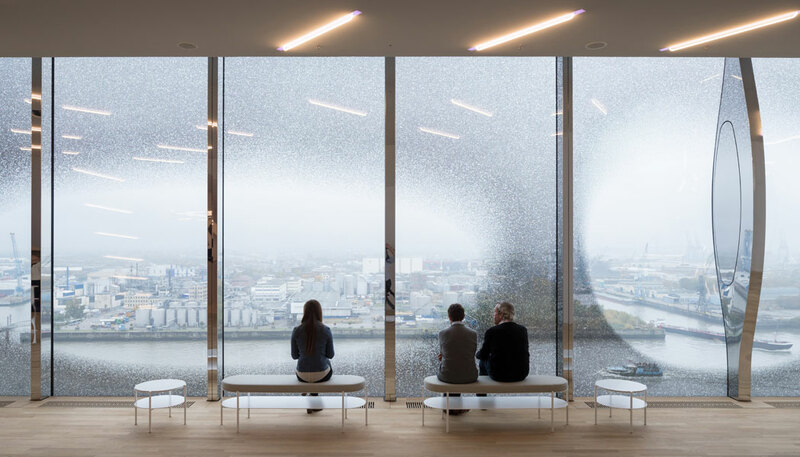 Over 26,000 guests visited during the weekend after the opening of the Elbphilharmonie Plaza in November 2016. The opening ceremonies of the Elbphilharmonie Hamburg took place on 11 and 12 January 2017. 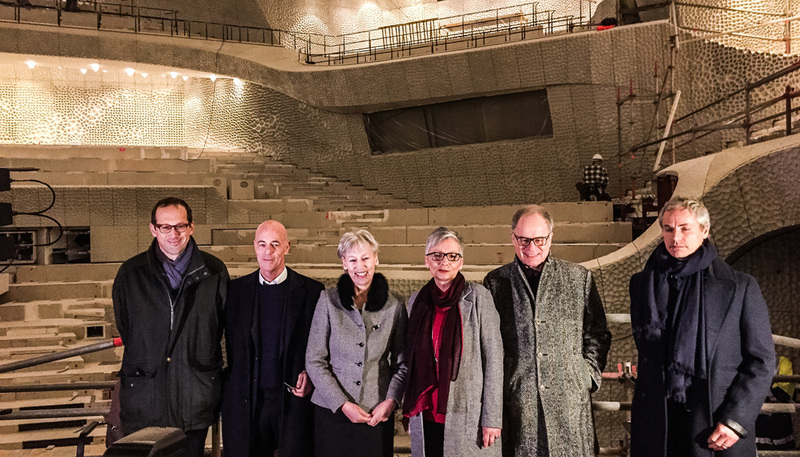 As part of the festivities, German Federal President Joachim Gauck, Mayor of Hamburg Olaf Scholz, Jacques Herzog from Herzog & de Meuron, and General and Artistic Director Christoph Lieben-Seutter have spoken. 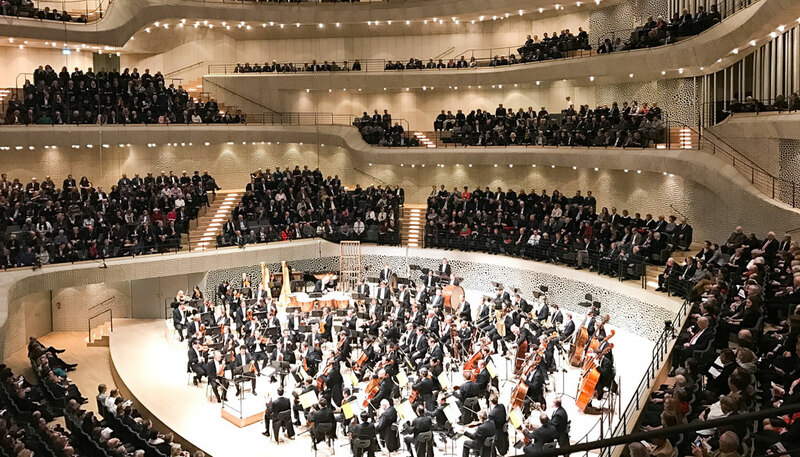 This was followed by the first concert in the Grand Hall played by the NDR Elbphilharmonie-Orchester – the orchestra in residence at the Elbphilharmonie – under the baton of Thomas Hengelbrock together with renowned guest soloists. The programme also featured the very first performance of the work commissioned specially for the occasion by Wolfgang Rihm titled »Zum Raum wird hier die Zeit« (Here Time Becomes Space). There was an encore performance of this concert on the evening of 12 January. Both concerts was accompanied by a one-of-a-kind light display on the facade of the Elbphilharmonie Hamburg. In the late afternoon of 12 January, the Recital Hall has also welcome its inaugural performance. Ensemble Resonanz, the ensemble in residence in the Recital Hall of the Elbphilharmonie, has dubbed this opening evening »unknown space«. The evening included, among others, the first performance of a commissioned work by Austrian composer Georg Friedrich Haas, under the direction of Emilio Pomàrico. The new philharmonic is not just a site for music; it is a full-fledged residential and cultural complex. The concert hall, seating 2100, and the chamber music hall for 550 listeners are embedded in between luxury flats and a five-star hotel with built-in services such as restaurants, a health and fitness centre, conference facilities. Long a mute monument of the post-war era that occasionally hosted fringe events, the Kaispeicher A has now been transformed into a vibrant, international centre for music lovers, a magnet for both tourists and the business world. 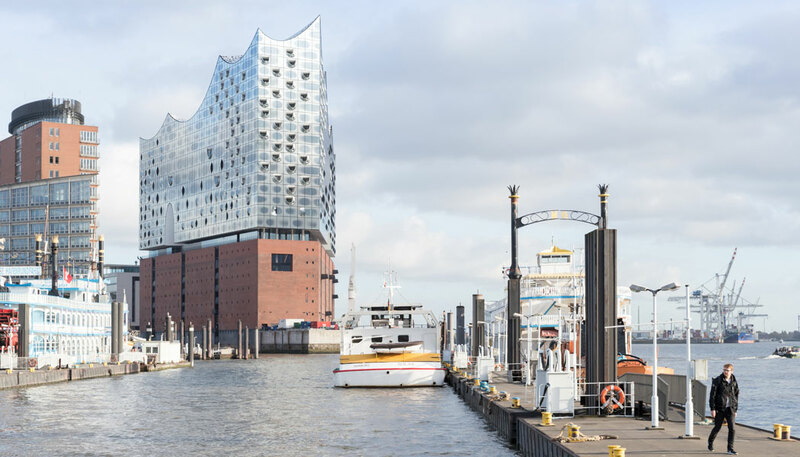 The Elbphilharmonie will become a landmark of the city of Hamburg and a beacon for all of Germany. It will vitalize the neighbourhood of the burgeoning HafenCity, ensuring that it is not merely a satellite of the venerable Hanseatic city but a new urban district in its own right. as a haven for architecture and design. 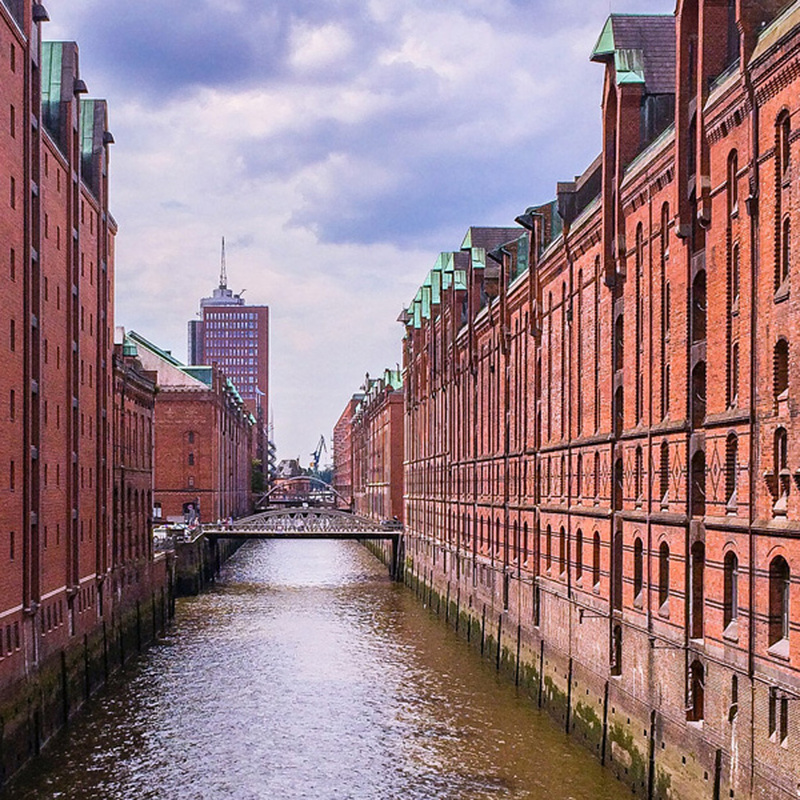 a-tour can show you what’s new in Hamburg’s architectural scene. We offer architects, and people interested in architecture, tailormade tours to a range of specially selected recent projects in Hamburg. a-tour are looking forward to welcoming you in Hamburg. 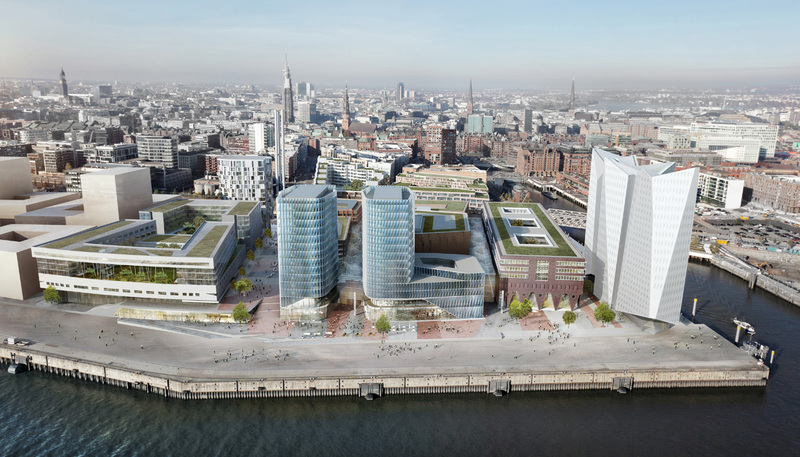 MVRDV with co-architects morePlatz have won a competition to design the masterplan of the Hamburg Innovation Port, a new 70.000 square meter waterfront development that will add to the high-tech hub of Channel Harburg in Hanse City, Hamburg. The plan for the mixed-use development uses a fusion of existing port typologies and dynamic architectural interventions to create a network of buildings containing hotels, laboratories, research facilities, offices for start-ups and a conference center. Located on the site of the old Harburger Schloss waterways, the planned development has been organized around a system of alleys between the street and harbor basin. 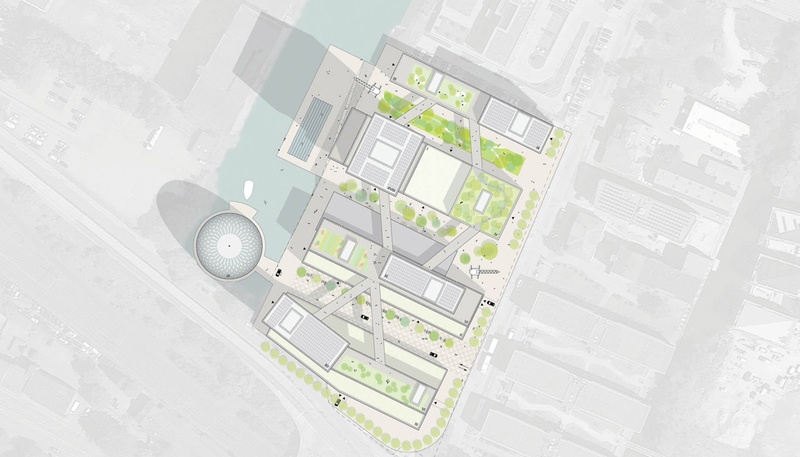 A three-story plinth containing a variety of public spaces borrows from the harbor typology, and in a later phase, will connect to surrounding buildings via a series of skybridges. On top of the plinth, increasingly glazed facades provide light and views to laboratories, and higher up, flexible office spaces. 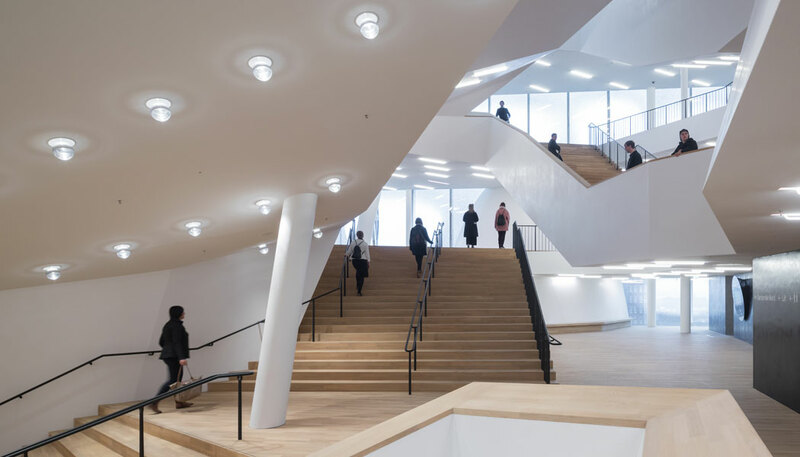 In the building’s center, special program volumes will contain restaurants, cafeterias and libraries. On the building roofs, occupiable green spaces have been arranged to create a park-like atmosphere linked by the skybridges, while arrays of solar cells will help provide energy to the complex. The interiors of the bridges feature flexible space that can be adapted to create large office areas. Parking, meanwhile, has been placed underground and out of sight, and is accessible through one communal entrance. Most of the complex will be ground-up construction, but one existing hall on site will be transformed to be used for temporary activities and to support construction of future phases. An additional floating building accessible via a jetty with contain a hotel. The plan is designed to be built in stages with the flexibility for possible program changes as the construction progresses. This will allow each of the five buildings to be realized independently. The competition was organized by Hamburg construction company HC Hageman. Hadi Teherani Architects have also been selected to build one of the architectural projects. The total budget for the project is estimated at 150 million euros. 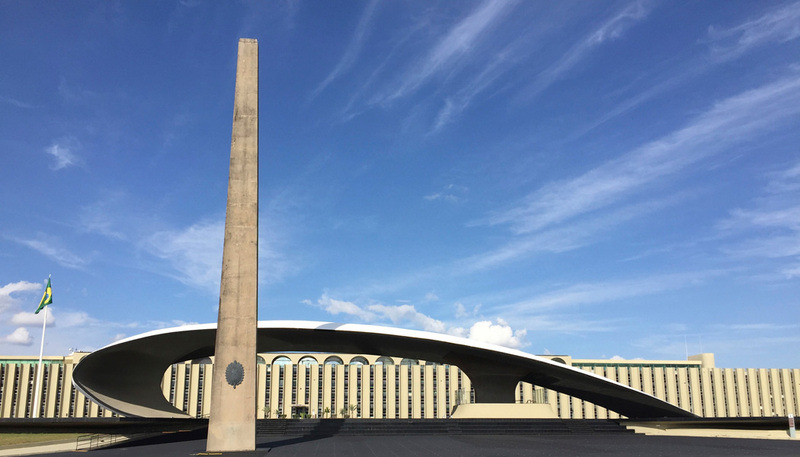 Due to the success of the trip we did in May together with our guiding-architects Partner GA Rio de Janeiro, we decided to do another architecture trip to Rio de Janeiro, São Paulo and Brasilia from 18th to 27th November this year. The tours will be held in German. Find the program here. 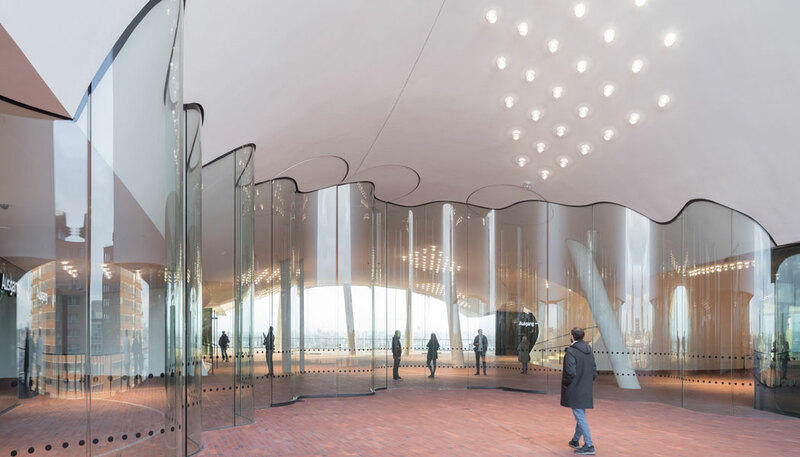 Another milestone towards an extraordinary acoustic is achieved: the 6,000 square metre – and worldwide unique – wall and ceiling membrane in the Great Hall of the Elbphilharmonie is finished. 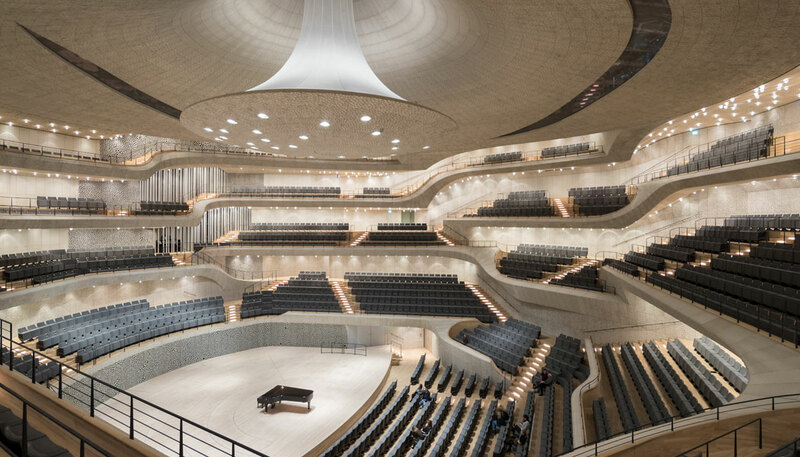 In addition to room geometry and materials, the so-called “Weisse Haut” is responsible for the perfect distribution of sound in the concert hall. 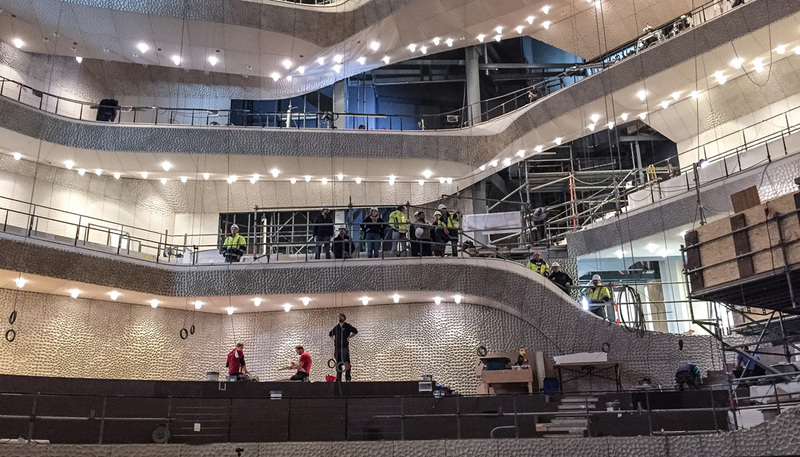 The design, construction, manufacturing and installation of the ceilings and wall surfaces in the Main Concert Hall, the so-called “Weisse Haut”, is one of the most complex developments for the Elbphilharmonie. 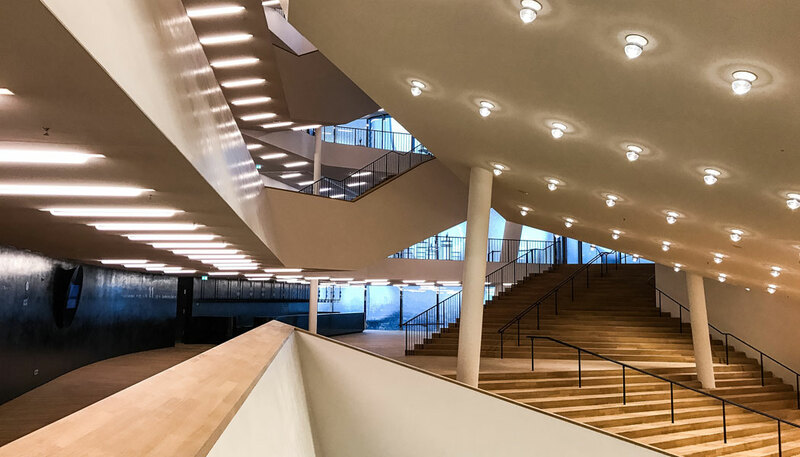 Its specific surface texture plays a vital role in the acoustics of the concert hall. These highly dense and extremely heavy engineered gypsumfibre board panels reflect sound, which is then directed and scattered by the countless seashell-shaped milled depressions. Approximately 10’000 panels in total are now installed. 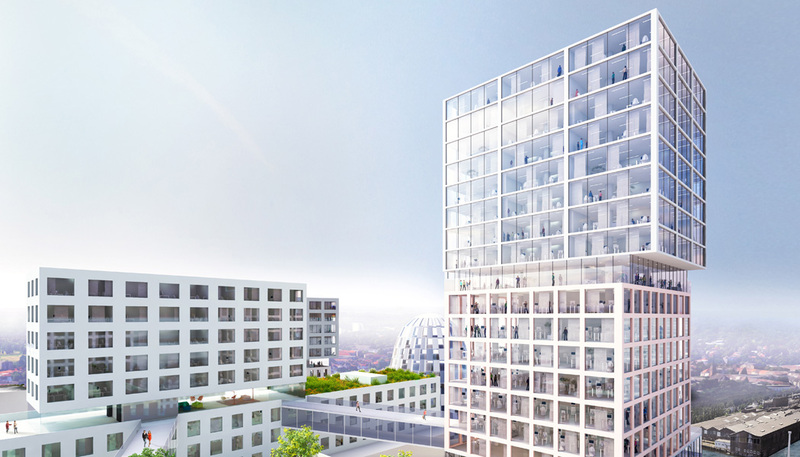 The completion of the “Weisse Haut” is the last contractual deadline before the handover of the building later this year. 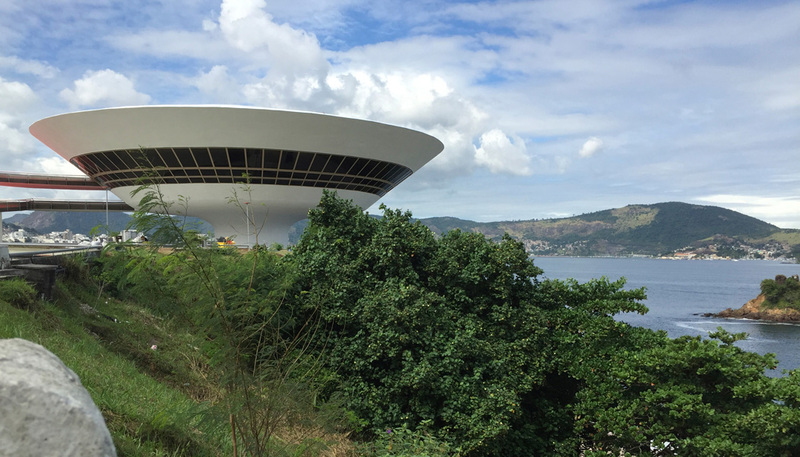 Jacques Herzog, of the Swiss architecture firm, Herzog & de Neuron that designed the concert house, said: “The distribution of sound in the concert hall is crucial to the quality of the acoustics. 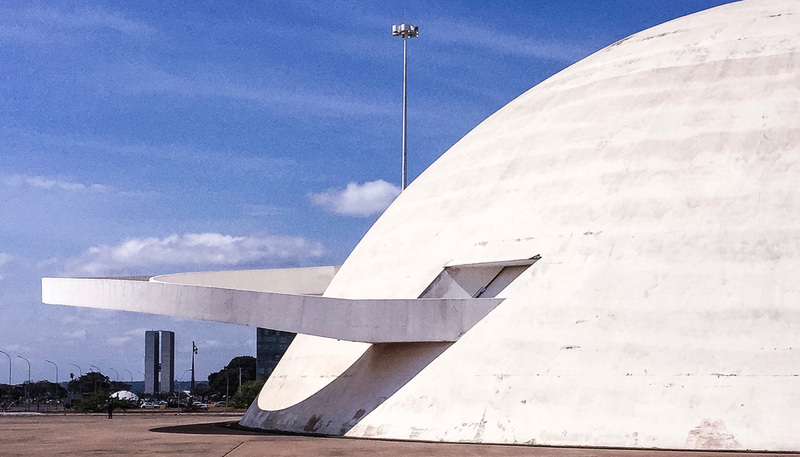 To this end, the geometry of the hall, the materials used and the surface structure has to match each other perfectly.” The special structure and the fluent transition between walls and ceiling give the concert hall something natural. 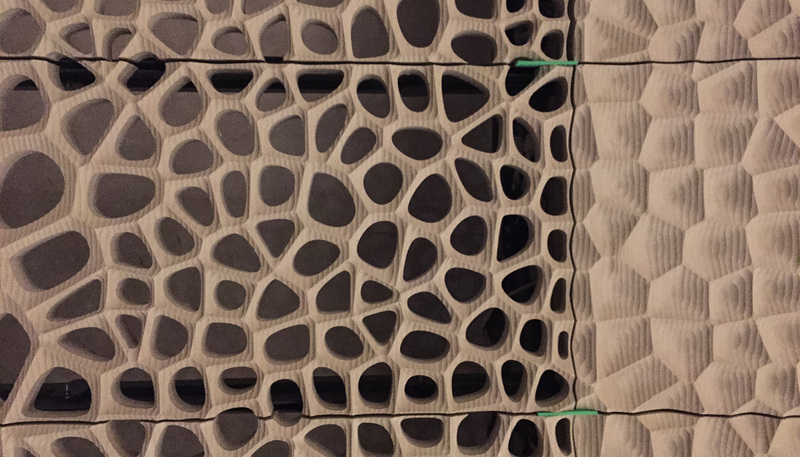 The surface structure was developed by Herzog & de Meuron after conducting intense research into the material and doing several form studies and patterns, in close collaboration with the Japanese acoustician, Yasuhisa Toyota of Nagata Acoustics, and implemented by Hochtief. The vineyard principle in the grand hall creates a special closeness between audience and artists. 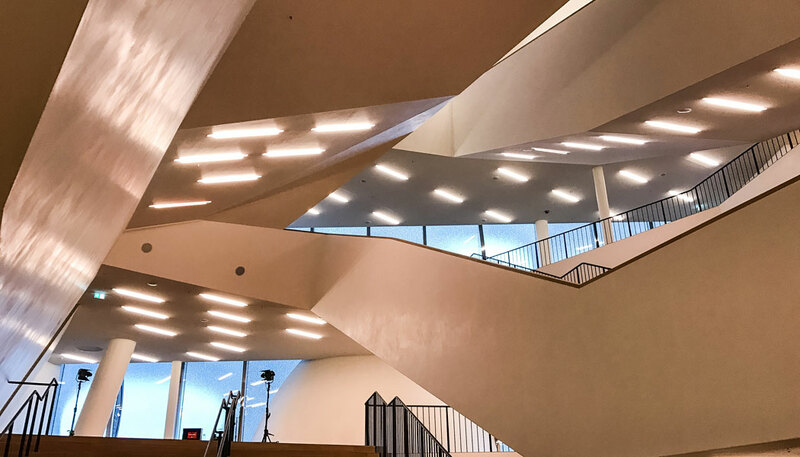 A maximum distance of 30 metres between the conductor and the audience in the Elbphilharmonie Hamburg will bring music closer than in any other concert hall worldwide. 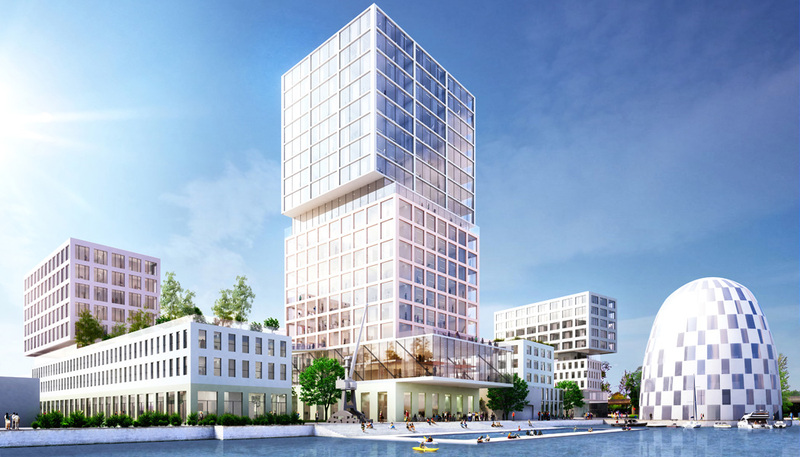 Delugan Meissl has won the competition for the so-called Campus Tower in the eastern part of Hamburg`s HafenCity. the whole ensemble as an urbanistic prelude for the development of the Baakenhafen, on the other hand generates urban qualities inside the building. Special functions, such as the Start Up and HCU offices on the first floor, the access to the roof terrace with a connected office and meeting area on the seventh floor as well as a bar with a 360° view between the head of the building and the shed roof are located within the breaks subdividing the building. At the same time, the settling out of the head of the tower creates a sort of beacon effect radiating far beyond the borders of the property, thus guaranteeing a landmark effect from afar. 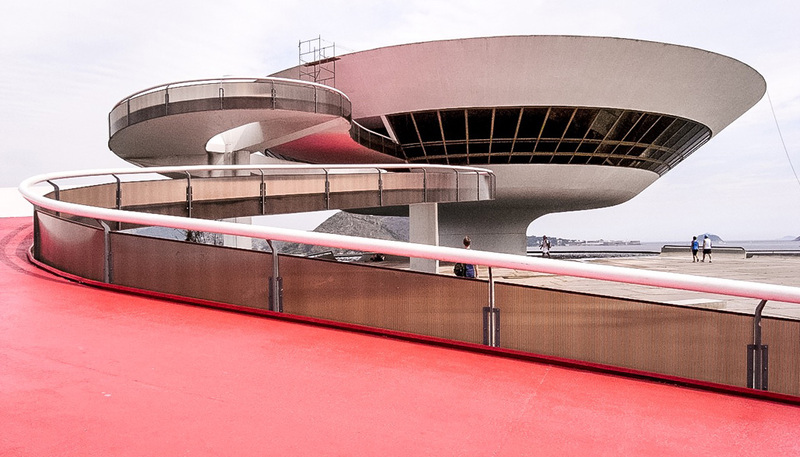 Two materials shape the outer appearance of the building. The opaque areas are wainscoted with dark concrete slabs; the translucent zones are designed as extroverted areas, which are concluded through deflector panes. This solution accommodates the requirements of noise protection, while allowing for a sense of openness thanks to the windows. 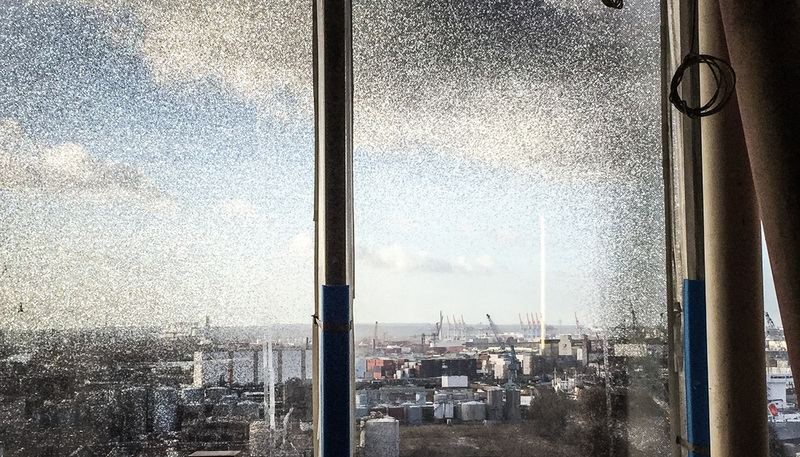 The external sunscreen is positioned between the deflector panes and the thermic shell and is therefore protected from wind and weather influences. The pattern dividing the façade follows the inner structure of the building; the opaque elements in the area of the pillars and the railing are reduced at the top. In consequence, this measure creates a self-contained elegance as well as an added value and a better view for the higher levels, while at the same time offering a cost effective solution and an energetically reasonable proportion between the transparent and the opaque materials. The structure of the façade carries on at the ground floor with large scale windows, which are connected to the opaque front. The 360° bar located on the rooftop enables diversified visual relations to the Hafencity, the Baakenhafen, as well as to Hamburg’s city center. A filigree elevation is created thanks to the shed roof reduced towards the exterior as well as its mirrored soffit; the activities within the building are visible from the street in the evenings. 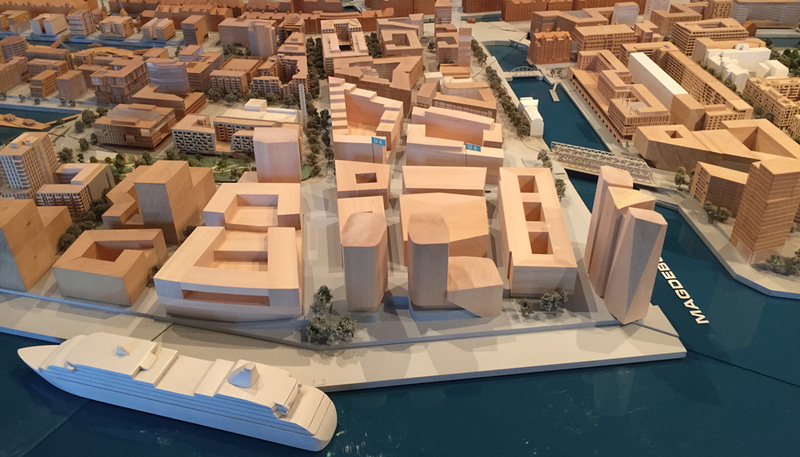 An exciting project that will enrich Hamburg’s HafenCity in future. 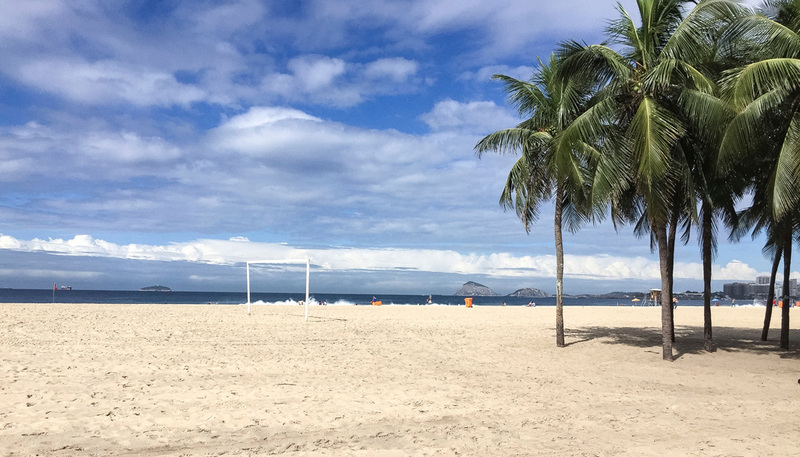 Rio de Janeiro, Brasilia, Belo Horizonte & Inhotim. Read more….. The multifaceted interplay between the individual architectural designs now generates a unified urban panorama whose spectacular climax is a waterfront on the River Elbe. 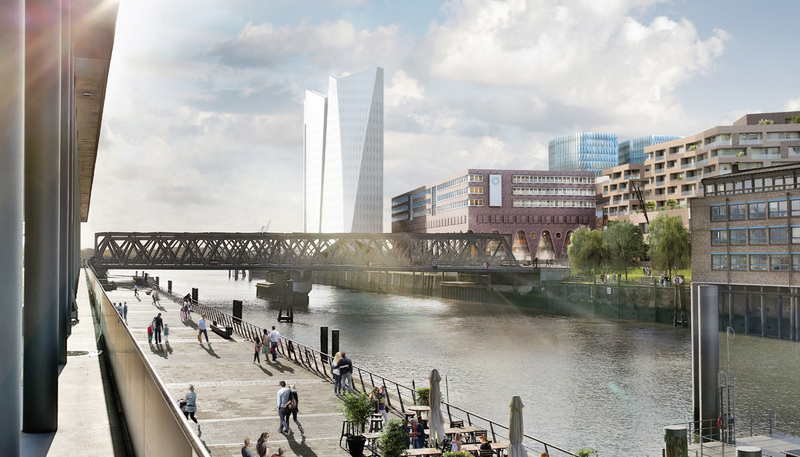 With its diverse, integrated uses and interaction between different buildings – red brick in the center and light-colored façades by the Elbe – Überseequartier forms the exciting core of a new downtown. 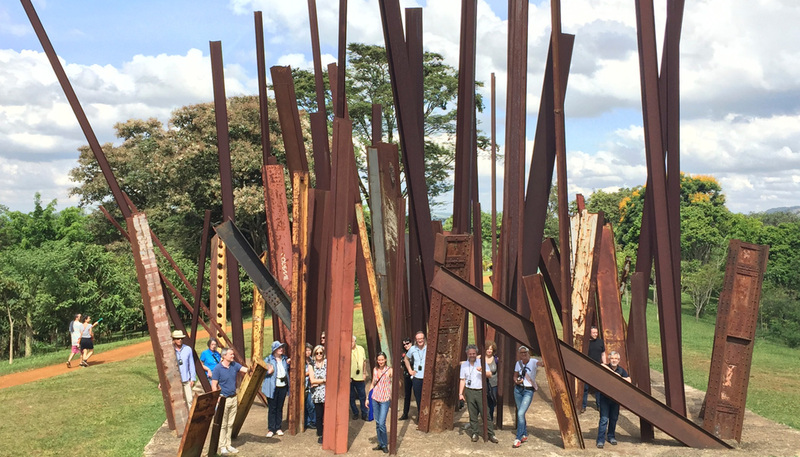 Involved in the project are internationally renowned architects such as Pritzker prizewinner Christian de Portzamparc and UNStudio as well as eminent architects from Hamburg and elsewhere in Germany. A new land-use plan is being drafted that will form the basis for building applications and for granting approvals. Unibail-Rodamco will begin construction 2017; completion of the central areas of southern Überseequartier can be expected by 2021. With a mix of retail, catering, residential and entertainment uses, plus the cruise terminal and hotel and office space, Überseequartier is the commercial heart of HafenCity. Northern Überseequartier is almost complete and boasts a multitude of shops and restaurants, a hotel and apartments. Development of the southern part was delayed, but the breakthrough came here a year ago. December 2014, Unibail-Rodamco – Europe’s leading listed commercial property company – took over responsibility for overall development and completion. Throughout Europe the company creates inspiring spaces where modern design is coupled with outstanding locations and a high level of comfort. The result is places where people feel at ease and want to linger. Around €860 million is being invested in Überseequartier, currently the company’s most important development project. 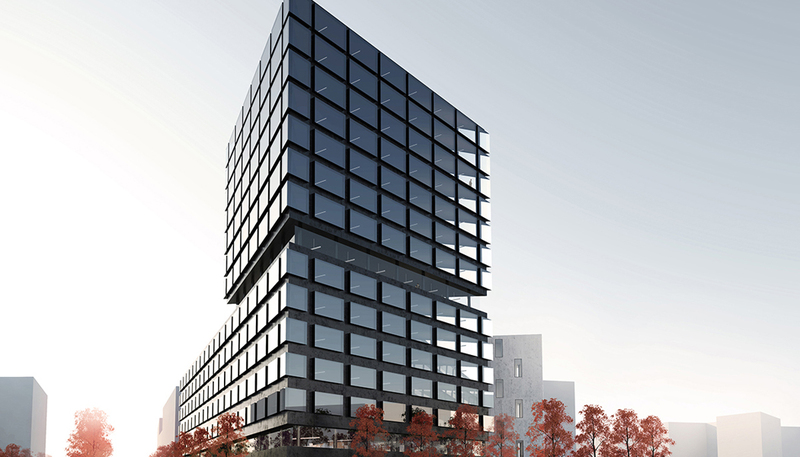 A new place to live and work is emerging on 260,000 m², of which about 80,500 m² is for retail, about 55,000 m² for residential and about 65,000 m² for office uses. Culture and entertainment will cover about 12,000 m², catering about 8,000 m² and hotels about 40,000 m². In the course of the change to Unibail-Rodamco as new project leader, the use concept and urban-planning structure of southern Überseequartier were comprehensively reworked. The opportunity was taken to make the retail component more attractive, to reduce the share of office space and increase residential areas, and to integrate the cruise terminal better into the urban landscape. Retail space in southern Überseequartier will be accommodated on three stories – basement, upper ground and first floor – with circular walkways on the two lower levels. This will make a mix of store sizes possible and give scope for generous storefronts. Buildings south of the subway will be protected against wind and rain by a glass roof and altered positioning. The shopping experience will be greatly improved as a result, even though – in comparison to a fully air-conditioned mall – the open thoroughfare between the buildings will be maintained. 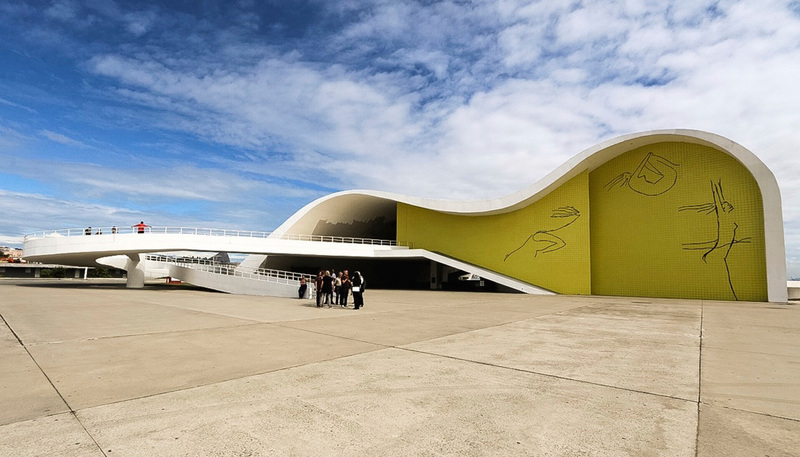 As well as Christian de Portzamparc, who is also responsible for the design of the Cruise Center, the other architects involved in reworking the plans were Carsten Roth Architekt, léonwohlhage, kbnk, Hild und K Architekten, Böge Lindner K2 Architekten, Lederer Ragnarsdóttir Oei, UNStudio plus BB+GG arquitectes for the open spaces, Saguez & Partners for the interior design and Sobek Design for the roof construction. HPP International was chosen as the master planner for coordinating the individual projects and making sure the high design standards are met. As is generally the case in HafenCity and for all of Unibail-Rodamco’s projects, high sustainability criteria are met in southern Überseequartier, too. All of the buildings have either HafenCity gold Ecolabel certification or meet the international BREEAM Excellent Standard.